PF Wonder Wash is effective in cleaning areas before the application of PF Wonder Salve, as it is deep cleansing, but not damaging. The neutral pH level of PF Wonder Wash is ideal and makes the wash the perfect accompaniment to PF Wonder Salve. 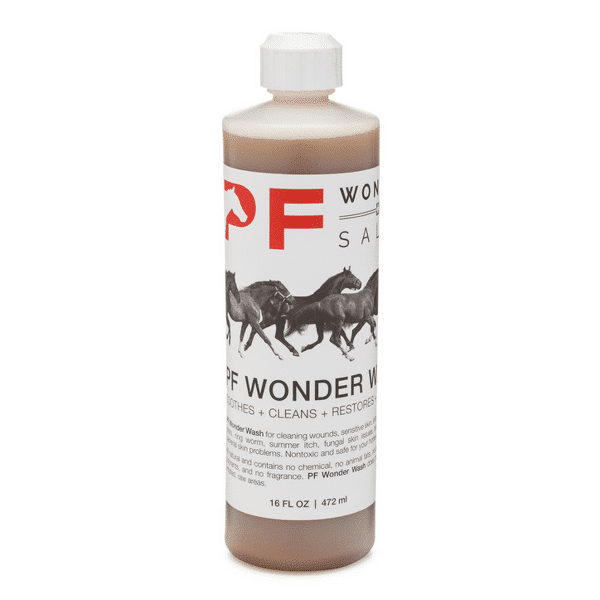 We highly recommend PF Wonder Wash for areas where PF Wonder Salve is being used. 16 fl. oz. Warning: You may like this product so much you will steal it from your horse, and use it yourself. Gentle enough for a baby. Non-irritating. Great for acne and psoriasis. PF Wonder Wash is naturally anti-bacterial and naturally anti-fungal. It is beneficial for irritated rashes, bare spots, ringworm, summer itch, fungal skin issues, bites, and bumps. PF Wonder Wash does not sting or burn irritated, raw areas. Warning: You may like this product so much you will steal it from your horse, and use it yourself. Gentle enough for a baby. Non-irritating. Great for acne and psoriasis. Wet area with water, gently lather PF Wonder Wash, then rinse with water. Wild Virgin Palm Kernel Oil, Coconut Oil, Shea Butter, Ash of Dried Plantains, Banana Leaves, Cocoa Pods, Agow Tree Bark, Distilled Slash Pine (Pinus Elliottii) gum. I ordered PF Wonder Salve and applied it to a fetlock wound that had severely granulated and was increasing in size weekly. After applying Wonder Salve to this area for 5 days the wound has markedly improved and has hair now growing. Very pleased to give this product a five star rating! Great product. Works magic with the cleansing of the wound. Horse tolerates very well. Love it! Got more to have if any of the other horses, scratch themselves! The animals like this product. It goes on gentle and cleans well. I want to say that I tried everything and then found this product amazing, my horse got caught in a wire, cut her leg badly, with using the other products offered my horse has healed, I am ordering just to have it in stock. Thank you, I love there products. Saved my horse!! Great product and great service. Had a minor mix up with my order but after contacting the company, everything was fixed right away. I recieved the correct order and even recieved an email from the business with an explaination and apology. Great customer service. This is the best product on the market. If I had not seen myself just how great it is, I would not have believed it. My horse’s leg had a horrible wound and we were treating and treating and not having results. After just two days of treatment with PF Wonder Wash and PF Wonde Salve, we saw amazing results. I am a believer. This wash is a must have to aid with the salve…it cleaned the wound so well, you can truly see clean clear flesh to treat with salve. The wash bubbled up great showing it was working and was pain free to our horses! For sure a must have in our treatment cabinet. Product works very well in conjunction with Wonder Salve and cleans the wound well.No stinging. Recommend its use. This wash works great. So much easier to treat the injury when a horse is not afraid of any pain. Half the time he falls asleep while we’re cleaning and treating his injury ( tore the heel bulb off his hind hoof). We have no barn stall to put him in so he is left out in the elements of the crazy weather changes of Alberta, Canada. It is awesome!…and the piece of mind this product has given us is an added bonus. I love the way this shampoo cleans! No residue and leaves the skin and hair soft and ready for treatment. Just wanted to point out it works great on sensitive areas. Left them clean and in no need of extra products.